For the safety of user and patient, it is highly recommended that only qualified dentists should work with dental diamond burs. Attention should be paid to speed of work (RPM). In particular when working with a large head diameter and coarse or super coarse grit size. Using a bur with too high RPM level, could generate undesirable heat. Do not force a bur into the turbine. In case of difficult access, check both turbine and bur. Remember- Strauss Diamond dental diamond burs are guaranteed and shall be replaced if found incompatible. However, special attention should be paid to instructions of use and maintenance of the turbine. Strauss Diamonds dental diamond and carbide burs are designed for several uses and are autoclavable. Please note the FG mark on the package indicating the use in high speed turbine. Use the bur with sufficient water coolant. Apply a feather touch (up to 150 gram) while working with the bur. Do not keep the bur still on one spot – Keep constant movement to avoid burning of the bur. Magic Touch burs are designed to use on porcelain, lithium disilicate, zirconia and natural enamel. Do not use the Magic Touch burs for any other material. Disinfect and sterilize the burs before every use! Use sterilizing and cleaning devices and materials according to the manufacturers recommended procedure. It is the responsibility of the user to ensure that sterilization is effective. Sterilization of rubber polishers use the same process as the multi use burs with one change – please use a specific disinfection solution designed for rubber polishers instead of the solution designed for dental burs. Our CE is valued for Sterile and non-sterile dental diamond burs, non-sterile carbide dental burs, non-sterile rotary grinding and polishing instruments. WARNING: Burs not marked sterile should be sterilized prior to use. Manual Cleaning: Presoak in enzymatic cleaner to loosen debris (5min.) Brush away remaining debris. Rinse (2 min. ), dry with absorbent lint free towel. Following sterilizing or cleaning methods, dry the burs and store in a clean and moisture free environment. Inspection after Cleaning: Visually inspect bur, with magnification if needed, to ensure that all debris has been removed, if not repeat, cleaning process. WARNING: Burs cannot be sterilized properly unless they are thoroughly cleaned, free of debris. Autoclaving: Burs may be sterilized by using a dynamic air removal sterilization cycle. Sterilize in a FDA approved pouch at full cycle with a dwell at 132*C/270*F minimum for 3 minutes. Avoid cold disinfectant solutions. These solutions do not sterilize and may contain corrosive agents that degrade the performance and strength of the carbide bur. Use sterilizing devices according to the manufacturers recommended procedure. It is the responsibility of the user to ensure that sterilization is effective. Dental burs made of carbide and steel should be stored in a moisture free environment. This avoids the possibility of corrosion on which could weaken the joint of carbide and steel. Examine burs for excessive wear prior to and during use. Any bur that shows wear should be removed from service and discarded. 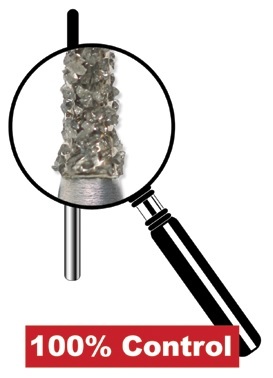 Using a bur with excessive wear may cause the bur to break or cause injury. The bur is inserted all the way into the handpiece. WARNING: Do not let the bur extend from the handpiece. Loose or extended burs may eject from the handpiece, break or cause injury. The bur is securely fastended to the handpiece. Handpiece drive air pressure does not exceed the manufacturer’s recommended operating pressure. Run the handpiece (rotate the bur) before and after contact with dental surfaces. Use light pressure and a brushing stroke. Avoid using the bur with a heavy transverse cutting pressure. WARNING: After each patient use the burs should be visually inspected, cleaned (manually or ultrasonically) and sterilized. WARNING: This product may contact nickel and should not be used on persons with known allergic reactions to nickel or nickel alloys. WARNING: This product may contain nickel, a chemical known to the State of California to cause cancer. Printed copy available upon request.